Scooters and things: Lets Start with a Bang! So some of my friends and myself included thought that there should be a blog just to look at all the odd scooters of the world and just to get some simple scooter news down and talk about the small things. So here it is, Scooters and Things. Of course I will talk alot about scooters here, but Things refers to what ever topic i want to discuss, If any reader would like to suggest a topic i will take it under advisement. Alright now that’s out of the way lets talk a little bit about myself, Why am I qualified to have a Blog? Well its free, and I have alot of free time on my hands here in Korea. I am a member of a scooter club in Raleigh NC ( http://www.raleighscooter.org/ ). I have driven a 2004 model STELLA from Genuine Scooters since I was in college. I logged about 14,000 miles in the 4 years i have had it. Including three 400 mile trips across the Great North State. I would like to think that I am quite cleaver when it comes to matter of the two wheels and small engines. I’m a huge fan of the 50cc motors as well as the larger engine scooters. 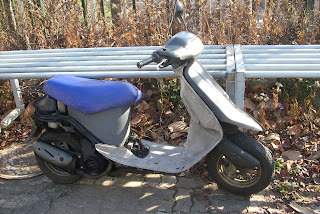 Unfortunately I was sent to Korea, and I could not ship Serenity (My Stella) scooter with me. However I was able to find a decent couple of scooters to work on and fiddle with while here. I’m going to be taking a lot of pictures of the scooters and mopeds that I find here in the area. I will document any trips and any tips that I pick up along the way. So I guess the First thing I will mention is the 1998 Honda TACT. 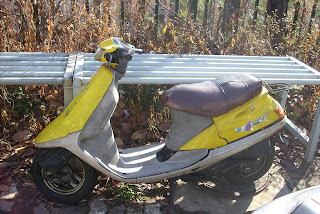 It is a two cycle 50cc scooter, similar to the Honda Metropolitan in shape and size. It is a small but extremely powerful 50cc. I happen to come across it when I saw a small man pushing it into the garbage on a Saturday night. I managed to remember enough Korean to ask if he was throwing the scooter away, which he replied Yes. Taking this into consideration I pushed the scooter to my apartment and locked it up. The body falling apart, I managed to hold it together with some Duct tape. I remembered that most smaller Honda, Daelium, People, and Yamaha scooter have a similar ignition trick. If you rip/disconnect the wiring from the ignition you can kick start it and ride it where ever you need to go. After about 2 hours of taking apart the engine and cleaning the carburetor, I pushed it to the gas station and filled the tank. a few swift kicks and I was on my way! At the time the scooter was topping out at about 20mph which means, stick to the sidewalks and out of traffic. I managed to fix some of the body panels and give the scooter a "new look". I always say that no means of transportation should go without a name. So it got the name Dead Ped, it just kinda sounded like a good name. well if you have any topic you might want to cover just email or comment. Here is the Dead Ped still in its orignal 1998 body. And Below it is the current look since i have altered the body, and engine.